Next Monday we’ll be co-hosting a talk with the China Institute by Tong Lam, a historian and visual artist, and author of A Passion for Facts: Social Surveys and the Construction of the Chinese Nation State (University of California, 2011). 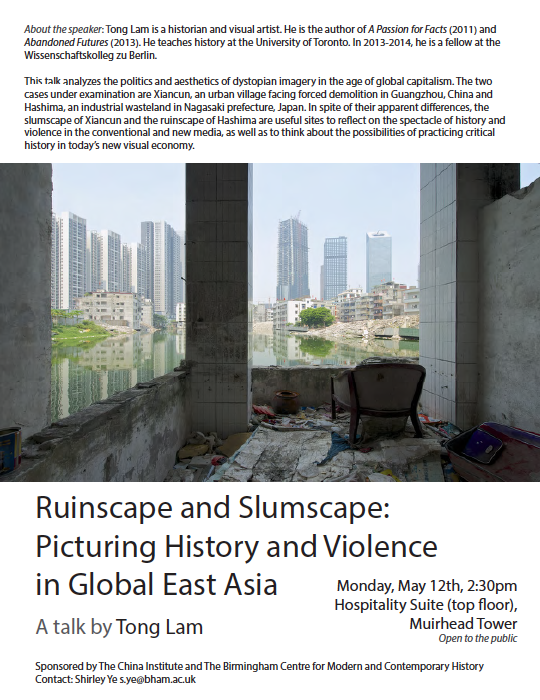 Tong Lam will be speaking on “Ruinscape and Slumscape: Picturing History and Violence in Global East Asia”. The talk will take place at 2:30pm on Monday May 12th in the Hospitality Suite (top floor) of Muirhead Tower. All are welcome.